Swag. Short for “Swagger”, is what rappers and the youth of today call style. And now you can get it delivered to your door. Swag Of The Month is a new $9 subscription service that lets men receive t-shirts and other clothing items that match their preferences from independent fashion designers. Today it raised a $100,000 Angel round from Quattro Development to legitimize the previously bootstrapped business. Dressing cool is about to get easier. The subscription fashion model has taken off amongst women. ShoeDazzle has raised a baller $60 million from investors including Andressen Horowitz, Polaris, and Lightspeed. BeachMint is rumored to have been valued at $150 million when it raised $23.5 million in June, and its site BeautyMint got 500,000 visitors its first day. The concept of disconnecting fashion from actually shopping is also gaining steam with men. Trunk Club raised $11 million in September for its high-end service where men pay retail prices for fancy $48 polo shirts picked out by Skyped-in fashion consultants. If low-end, long-tail men’s subscription fashion can become anywhere near as popular as these services, Swag Of The Month’s angels are going to feel pretty damn smart. The ShoeDazzle and BeachMint model doesn’t seem broken, so Swag Of The Month’s founders Erik Huberman and Austin Smith didn’t fix it. Subscribers fill out a style preference survey, pay the fee, and are guaranteed a cool piece of clothing in the mail each month. Shirt not as swag as you hoped? Return it for a different one. The service launched last month on pocket change and now has 300 paying customers. 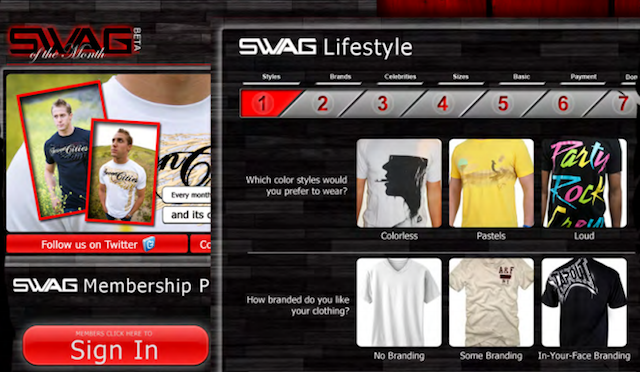 Retailers give Swag Of The Month their clothes for free as an alternative form of marketing. Huberman explains that getting your clothes worn is a much better strategy for a fledgling designer to gain exposure than buying ads for a label no one’s heard of. The supply of designers is plentiful around Swag Of The Month’s Santa Monica, LA office, and subscriber fees go towards shipping costs. I frequently talk to men who want to dress better but dread visiting stores, trying things on, and spending a lot. Swag Of The Month makes men look cool with none of the work and at a fraction of the price. I mean, seriously, you can’t get a cool t-shirt for $9 anywhere, and sometimes the service mails out jeans or winter wear at no extra cost. T-shirts are light, but Swag Of The Month will still have to streamline fulfillment eventually to boost margins. For now, the $100K will go towards day-to-day operations, marketing, web development, and designer partnerships.